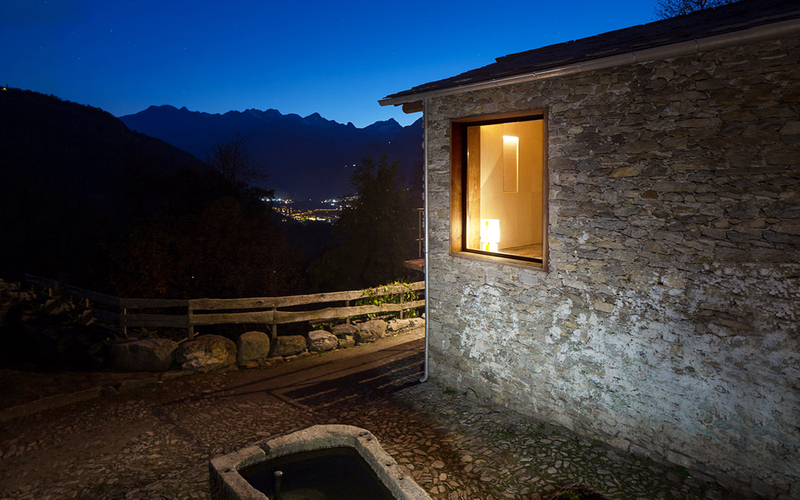 The project involves the restoration and reuse of two old farm buildings located in a small mountain village in northern Italy. The project is an exercise of "correct practice" intervention in a strongly traditional historical context, transforming the existing with respect and adapting it to contemporary use. The house is situated at the entrance of Val Bregaglia, in Northern Italy, in the middle of the 16th century rural settlement of Crana. In the late ‘700 the village had more than a hundred inhabitants, but nowadays it’s in a state of semi-abandonment and the few restored buildings are almost exclusively used as holiday homes. The client bought a first lot where there was a semi-collapsed rural house, consisting in a barn and a stable, with major problems of geological stability. The side of the slope has been dug out and has been secured with reinforced concrete structures, while the original stone volume has been restored with a philological approach. On the ground floor, it has been realized a bedroom and a bathroom and, on the upper floor, a living room and a kitchen, as well as a mezzanine area with space for two beds. After the completion of the construction works, the client bought the adjacent building, which was in enough good conditions for been restored more easily. The new project includes an aerial link between the two volumes, consisting in a wood and glass bridge. The two buildings become a unique articulated and distinguished living space. The external architectural choices reflect the local traditions in terms of materials, typologies and morphological aspects. In this project of "re-use/recovery/restoration" the real issue has been how to turn a simple barn into a house with high standards of energy performance. The only visible contemporary signs on the facade are the presence of two large fixed windows, which are facing on the South and on the East towards the mountain landscape. In the interior, three are the elements in relationship: the wood, the sunlight in the space, the panoramic views.